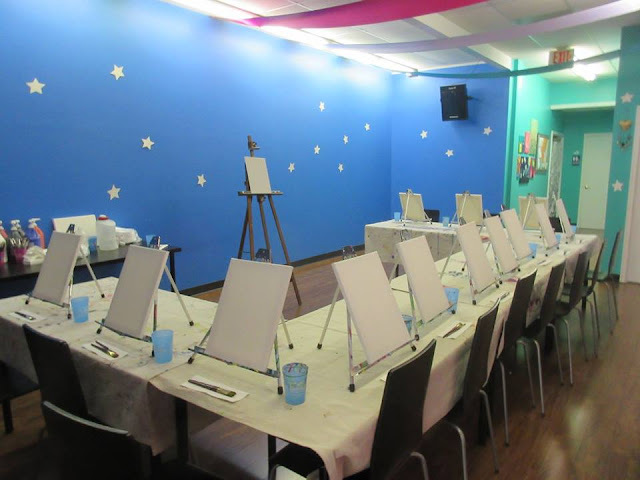 Art Factory Body Art & Party Place: Paint Parties, How To Run A Profitable Event. A few weeks ego we came back from the FABAIC. It's always a busy time a year flying to Florida and meeting so many amazing artists! Just like every year, we try to bring to you new and fresh information, sharing our ever growing experience from running the Art Factory here in RVA. 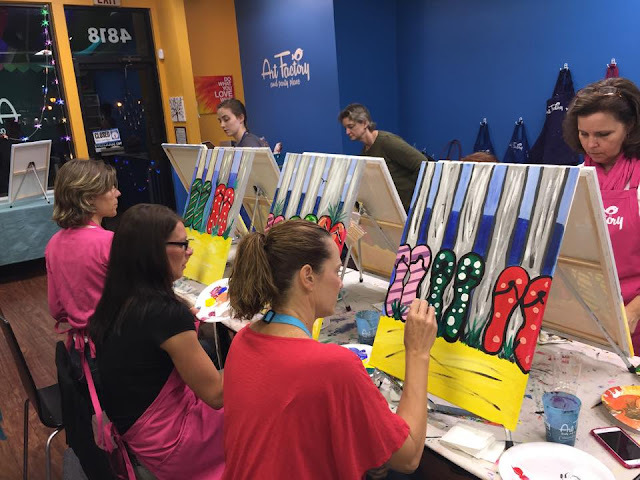 This year I was happy to teach a new class and share our experience about art parties. I have several artists approach me and asked if I can share the class notes so I will do my best to post them all here. If you choose to add this service to your business, make sure you check the local ABC law in your area. Some states are easier than other. You better know the law rather then ignoring it. If you are hosting a party in a location that already serves alcohol you have nothing you worry about. You will be automatically covered under an existing license that is obtained by the business you are partnering with. If you have a location such as church etc, you may need to obtain a one day banquet license. Lets be clear, This license is for attendees to consume alcohol they bring from home, not for you to serve or sell it! All local ABC law can be found online, you just need to do local research. I also found that the local ABC officers are very nice and helpful. After all they want you to play by the rules so if you have any questions you can just call and ask, you will be amazed by the service you will get! Setting up an event page takes about 5 minutes and you can be password protected. the cost quickly add up and take away from your margin. They also seem to look cheap and unprofessional. or wine you will be able to clean it up without any damage to the furniture below. Also you need to avoid working over a carpet. Always assume that paint water is going to spill, it happens often. no choice, bring drop cloth to cover the floor. weigh alb each, do you really want to carry 40 of them from one event to the next? Mobility is everything so pack light! ones but they will pay themselves off in one visit and will save your back over and over again. Canvas: Stretched and primed. Pick the size that works best for your client and project. on this tool, plan on replenishing your supply several times a year. Make sure you get short handled Teklon brushes. If the handle is long it opens a door to more water accidents... they are just harder to handle for beginner artists. You will need a flat brush and a round brush per attendee. At least 1/2" on the flat and a #2 or #3 for the round brush. Water container: Each student gets their own container, they are not made to share. 12oz cups work great. Make sure they are water tight. Costco and always have a lot handy. plates and always make sure to bring extra. Paint: We get our paint in large containers with a pump. We will soon have some available at the art factory store. We tested many sources before finding the right paint. Don't buy anything in a small tube, it has to be inexpensive and basic. 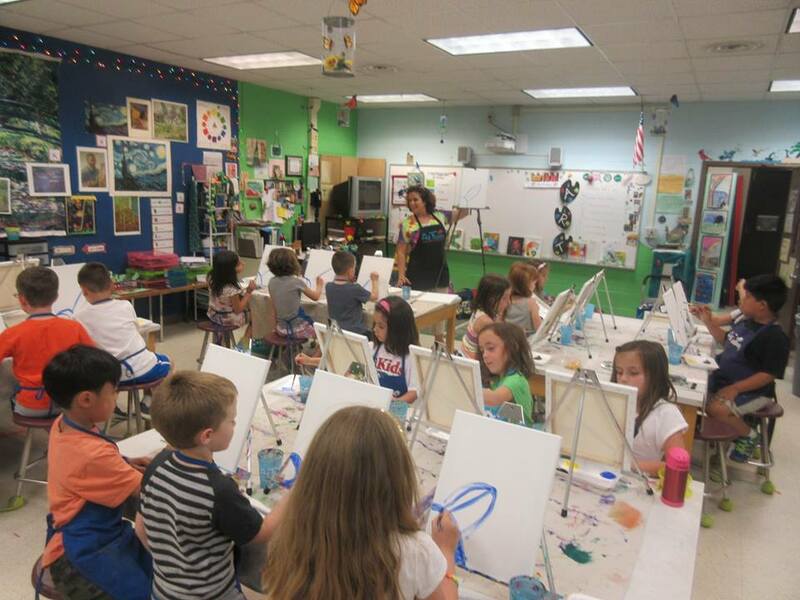 You will see your students using a a lot more paint then they actually need even after you provide the first serving. It does not have to be top of the line but it does have to offer good coverage. Aprons: If you get cheap ones you will have to buy them over and over again. Getting nice washable aprons will save you money in the future and you can put them in the laundry as needed. • A large zip-lock bag to place all dirty brushes. You do not want to wash them at your customer's house!! take the dirt with you and clean it quickly when you get home. • A large trash bag (or two) to collect all the plates and paper towels after the class. • A water container with a lid to pour water into individual cups. • teacher floor easel. Try to find a tall and sturdy one that will last. • Clip board with sign up sheet for your mailing list. Adults will want to know when and where is your next class. Teaching techniques: I suggest gathering some of your best friends and doing a trial class. You need to really simulate the classroom in order to understand the challenges you may encounter. I do not trace the canvases before the class starts. This is not a coloring class but a painting class. the results will vary based on the skills of your students but you will be amazed how great they can do if you really brake it down to basics! Remember that the people attending the class are in it for the social aspect.- They want to have fun!! They are not expecting to become Picasso right after they leave your event. Some may be very stressed just for stepping outside their comfort zone and trying something new. I try to keep the environment funny and loose. I show technique and teach them how to correctly load a brush while reminding them that they need to make sure they don't drink the paint water or wash the brush in the wine. (it happens more often than you would think) If your students have a good time they will come again and again, and will refer you to their fiends! After all a referral is the best compliment ever. Hi! I was wondering how you go about doing a class at an actual elementary school. I got in touch with the PTA that puts together the after school enrichment programs.. they were very helpful to set up and get us to be part of the offering to families. WE hold a class twice a year , 6 weeks long. 35 students per session... loads of fun!